Dorothea J. 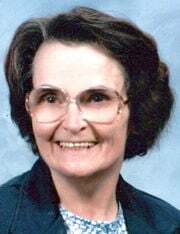 (Breed) Parker RUTLAND — Dorothea Josephine (Breed) Parker, 86, passed away peacefully on April 12, 2019, at Rutland Healthcare & Rehabilitation Center, following an extended period of declining health. Dorothea was born on June 13, 1932, in Evansville, Vermont, to Allen and Dorothy (Wheeler) Breed. When she was very young, the family moved to the Wheeler Brothers’ Nickwackett Dairy Farm in North Chittenden where she grew up. Dorothea attended elementary school at the schoolhouse on Stoney Hill in Holden. Later, as one of the older students in the school, she would teach the younger students when the teacher was absent. She then attended Barstow High School where she was active in class offices and Girls’ State, graduating as valedictorian of the merged Pittsford-Barstow High School in 1951. She was also a member of the Holden Willing Workers 4-H club, winning many awards. On June 6, 1953, she married her high school sweetheart, Robert E. Parker, in Pittsford. They resided briefly in Rutland and then moved to Parker Hill in Pittsford where they made their home. She was employed by Cornish Wire in Rutland, the Wimett Insurance Agency in Pittsford, and as Pittsford Town secretary/bookkeeper. She was then appointed the first town manager of Pittsford, a position which she retired from in 1994. The 1993 town report was dedicated to her for her service. She then served as town auditor until 2007. Dorothea was a member of St. Alphonsus Liguori Church in Pittsford, where she was active in the Sodality and religious education. She was a member and former secretary of the Pittsford Historical Society. She also supported her husband’s membership in the Pittsford Fire Department during that organization’s many activities. Dorothea is survived by her children: Patricia Parker Carter, of Pittsford; Robert Parker Jr. and wife Gerri, of Proctor; David Parker and wife Michele, of North Chittenden; and Catherine Parker Winter and husband Bruce, of Saco, Maine. She is also survived by her grandchildren Amy Parker Manfredi and husband Christopher, Erin Carter, Samuel Parker and fiancée Meg Branson, Ashley Carter, Jason Beatty and wife Natasha Aljader; by her two great-granddaughters Rozzlynn and Catalina Manfredi; and by numerous cousins, nieces and nephews. She was predeceased by her parents; her husband, Robert E. Parker Sr.; a daughter, Marie Parker; and her sister, Phyllis Breed. The family is deeply grateful to the staff at the Rutland Healthcare & Rehabilitation Center for many years of devoted care. Memorial contributions in Dorothea’s memory may be made to the Pittsford Fire Dept., 152 Pleasant St., Pittsford, VT 05763. A funeral Mass will be celebrated at St. Alphonsus Liguori Church in Pittsford 11 a.m. Monday, April 22; burial will follow in St. Alphonsus Cemetery. Following this, there will be a gathering at the church hall for a time of remembrance.